When your library reaches elephantine proportions, enlist this parade of pachyderms to keep things in line. Holding gingerly on to his mother's tail, this baby elephant follows your book collection from A to Z. Inspired by the playful styles of the savanna, artist Eric Gross creates a charming silhouette scene on your bookshelf or mantel with his beautifully detailed bookend, crafted from carbon steel with automotive paint finish. Handmade in Kentucky. Made a great focal point in the library. He placed his favorite current books between the book ends. Stunning silhouette captures the bond between mother and child and an elephant reputed to never forget, be protective, loyal, nurturing and strong.... all the sentiments I wanted this gift to reflect upon my daughter. 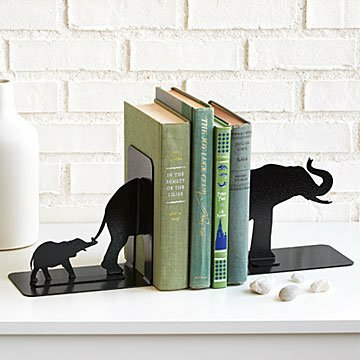 Beautiful bookends that look great with the elephant nursery theme. Great quality & would highly recommend. Beautiful design... So very useful! Perfect for many rooms. Will add to any dorm room. Will use it in the family library. My husband is a new dad, and I ordered him this set of bookends for Father's Day. He loves elephants and they perfectly capture the essence of the father-son relationship! I love elephants and these bookends of a mother and baby are wonderful and very well made. Would love to get the giraffes next! I hope you keep this artist's work in stock.